Mystery author Catherine Lloyd is here today to chat a little bit about her new novel, Death Comes to Bath. Catherine Lloyd was born just outside London, England into a large family of dreamers, artists and history lovers. She completed her education with a master's degree in history at the University College of Wales, Aberystwyth and moved to the USA with her family in 1998 living first in California, and now in Hawaii. 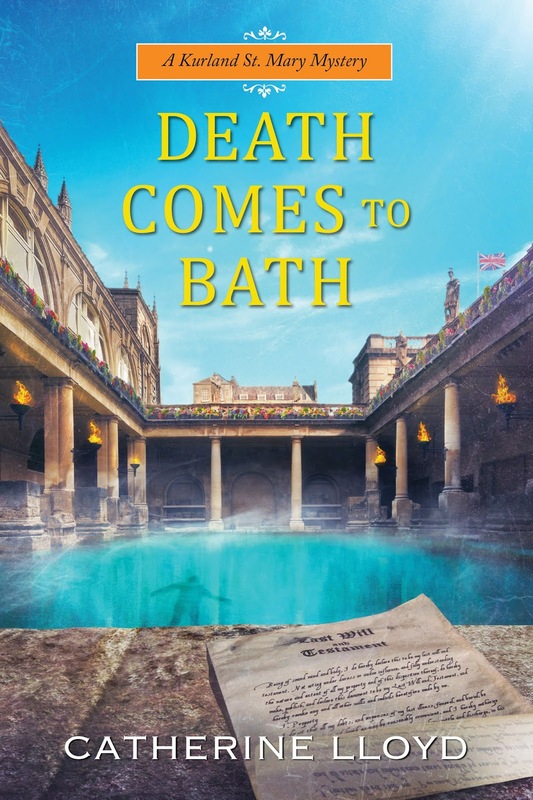 This book is a cozy mystery set in the English city of Bath during the Regency period where my amateur sleuths, Sir Robert and Lucy, Lady Kurland get drawn into a murder investigation involving the drowning of their next door neighbor in the Roman baths. I love the city of Bath. While I was visiting two years ago, I had the idea of someone drowning in the hot spring waters of the Roman baths and the book just grew from there. One of the nicest things about Bath is that you can retrace the steps of your nineteenth century sleuths, visit the places they visited, and walk the same streets as Jane Austen did. For a writer it is really helpful to literally be able to see the scene of the crime. I made stuff up all the time when I was a kid. I was always in trouble with my parents for my inability to separate facts from fantasy. I decided to write seriously just after I had my fourth child and moved to the USA, because it seemed like a good time to explore a new career. I do write full time because as well as cozy mysteries, I write romance novels under a different name, and I produce three or four of those books a year. I’m lucky enough to live in Hawaii, so after I get my daughter to school I write for about six hours without interruptions until she comes home. I hardly write anything down plot-wise even for my mystery’s I just wing it. I wanted to be a ballerina, a nun, and nurse in that order, none of which worked out for me. I love being a mother and being an author just ticked all the right boxes for me. If you want to keep updated with all things Catherine Lloyd please check out my website and consider joining my newsletter or following me on Facebook. Thanks for joining me today, Catherine. Novelist Ted Neill is back for a visit. We’re chatting about his epic fantasy collection, The Complete Elk Rider’s Series, today. Globetrotter and writer Ted Neill has worked on five continents as an educator, health professional, and journalist. He is the founder and executive editor of Tenebray Press. His writing has appeared in The Washington Post, Recovery Today, and he has published a number of novels exploring issues related to science, religion, class, and social justice. His 2017 novel, The Selah Branch, attempts to confront issues of racism and the divided political environment of the US today and the 1950s. His debut novel, City on a Hill, examines the fault lines of religious conflict in the Middle East. 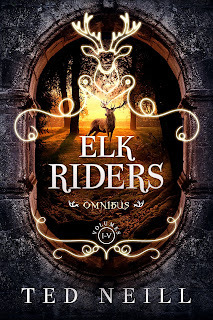 His five-book series, Elk Riders, wrestles with issues of ethics, morality, and belief against an epic fantasy backdrop. He wrote his most recent young adult novel Jamhuri, Njambi & Fighting Zombies after living and working at an orphanage for children with HIV/AIDS in Kenya. His memoir about those years, Two Years of Wonder, is a number one new release on Amazon. Follow him on Facebook and Instagram. Welcome back to Reviews and Interviews, Ted. Please tell us about your newest release. 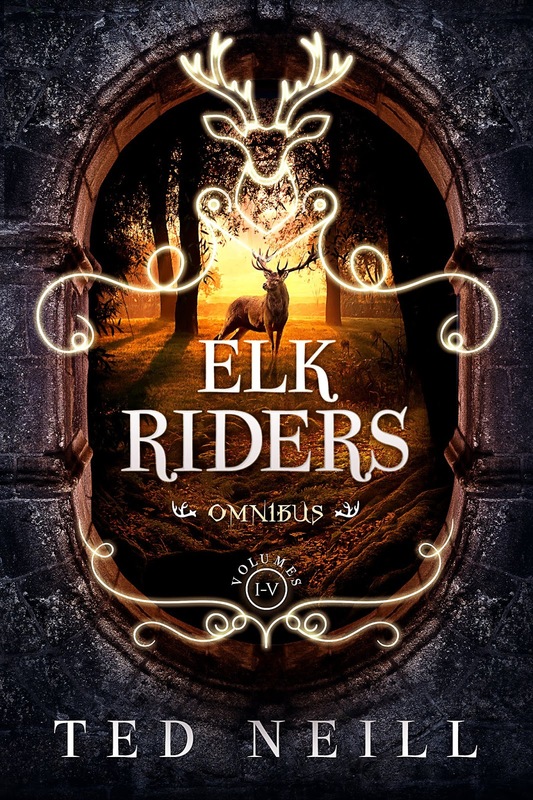 The Elk Riders Omnibus is the complete Elk Riders series, volumes one through five. It begins with the story of Gabriella Carlyle and her brother Dameon continuing through to the adventures of Prince Haille and his friends in the realm of Anthor. Adamantus, a magical elk, is the individual who connects all these characters. There are more stories to tell with these characters and this world beyond Elk Riders. I plan a follow up series, the Skyln Chronicles, in the coming years. But I wanted to provide fans with a way to have the complete Elk Riders cycle in one omnibus volume. It was really a simple love of the epic fantasy genre. I’ve heard some writers write with a specific audience in mind. I sort do and don’t. I guess I write books I would want to read! And I have been developing the world, characters, and themes in the Elk Riders series since I was an undergrad. The excerpt below is from Elk Riders Volume Three: The Font of Jasmeen. This is from the pivotal chapter when Haille and Katlyn, having struck out on their own and in disguise, cross paths with Adamantus for the first time. They are at a carnival and in some trouble of their own as they try to flee local law enforcement. Katlyn’s upper arm was exposed and on her bare flesh was a silver band, intricately carved to appear like a coiled, sleeping dragon. “Blast it, if that is not contraband, I don’t know what is,” the younger Inquisitor said. “What is that?” the woman said. They started off again, crossing the main thoroughfare and weaving between couples, families, and packs of children. For a few blessed moments they were hidden by the crowd but people were staring at them wide-eyed, especially at Katlyn, her hair disheveled, her tunic ripped, and a bloody knife clutched in her fist. Haille yanked her back between two tents just as Madam Palas emerged from a crowd of stunned onlookers. “We need to hide,” Haille said between deep breaths. The air was foul. He wondered if they were near a stable or pig sty. “Here,” Katlyn said, sheathing her knife, dropping to the ground, and rolling beneath the edge of the nearest tent. Haille followed, then froze on the other side, his sleeve to his nose, as footsteps passed just on the outside of the tent. The stench was even worse now and Haille recognized it: the tent of animal wonders. It was already dark outside but the inside of the tent was even darker. All but one of the lanterns had been allowed to burn out. There was no one touring the inside. Haille imagined customers were turned away by the sight of the proprietor passed out in the entryway. Not to mention the stench. The cages were arranged in a circle along the outer walls. The exception was one large cage looming in the center of the room next to the tent pole. Madam Palas called out to her apprentice just on the opposite side of the canvas wall. Haille prepared to run for the entrance but her footsteps receded, followed by the grunts and uneven footfalls of her limping apprentice. Albino bats, two-headed turtles, and three-legged goats stared back at him from cages with the wary look of animals often beaten. Haille was wondering how long they could hide there when he thought he heard a new voice behind him. He turned but only saw Katlyn staring into the largest cage. “What did you say?” Haille whispered. Katlyn did not answer, but something, something big, moved in the cage. It looked to be the size of a horse but was a gaunt horse if that. Haille came alongside Katlyn. “This is terrible,” she said, not taking her eyes from the creature within. Closer, Haille could see it was no horse but an elk. Its fur was missing in patches as if from mange and in places its skin was healing from lashes of a whip. Its knees were red and weeping from ducking down in a cage too short for it. The upper bars were nicked and scratched from antlers that gleamed like metal rather than the boney substance most antlers were made from. “Come on, we have to hide,” Haille said. Haille came to her side and realized she was pulling at the arm of the passed out animal master. He grunted and stirred in his stupor. Haille cursed under his breath, went to the man’s belt, and found a ring of keys before ducking back into the fetid darkness of the tent. “Here, but—” was all he said before Katlyn swiped the keys and set about trying them in all the locks. She tried the center cage first, the elk rising up behind the door, its hooves and its antlers banging against the bars. Katlyn dashed to the other cages where she met with immediate success, turning the key and setting free a sleek black fox with red eyes. A barn owl followed, next a cage full of ferrets, then the two-headed turtle. The three-legged goat needed help out of it cage. After lifting it, Katlyn shook the cage of the albino bats so that they fluttered out and circled in the air at the apex of the tent. Haille stood staring at the growing chaos, the fox slipping past his feet. The elk slammed against the bars of its cage, its eyes gleaming at Haille like two radiant moons. The cage still held. “This ought to do it,” Katlyn said from beside him, heaving up a hammer for driving tent stakes into the ground. Before Haille could protest, she brought it down on the lock holding the elk in its cage. Sparks flew in the darkness, incandescent as if from a blacksmith’s hammer. A woman screamed outside as the bats shot out through the main flap of the tent. Katlyn struck the lock again while the elk rocked the cage and raked its antlers against the bars. More sparks rained down. The beast huffed, grunted, and bellowed. Katlyn took two steps backwards, ran at the cage with a cry, throwing her entire body into the swing, her ripped tunic opening and the strange band on her arm catching the little light left, almost as if it were glowing. The apprentice dragged him out from under the edge of the tent and started calling to Madam Palas inside. “The other one is in here,” she answered back. Haille struggled but the apprentice was much bigger and, even wounded, he was stronger. Haille thought to kick him in his thigh where he was still bleeding but he didn’t need to. The apprentice’s eyes grew wide and Haille heard the approach of hoof beats. The elk rounded the corner and made a charge directly at the apprentice. The young man let go of Haille and dove aside. Katlyn rolled under the tent next and then the elk did something else queer: it lowered its rack of antlers to the nearest line holding up the tent and snapped it with one of the sharp edges. The side of the tent collapsed with a rush of air and a flutter of canvas. The elk did the same to the next rope and the next until the tent was completely deflating, with Madam Palas struggling beneath. Even the apprentice was too dumbstruck to act. The elk shook its head, dropped its antlers down, and snapped the lines to the next tent. There were screams erupting all around them as bystanders fled and tents crumpled. Chaos was good cover and Haille and Katlyn quickly scanned for the nearest path out. “That is one smart animal,” Katlyn said. “Then he is smart enough to fend for himself. Let’s get out of here,” Haille said. I have two new releases on the way. Finding St. Lo, which is a collection of memoirs from my grandfather, Robert L. Fowler and one of the medics, Gordon E. Cross, who served alongside him in his infantry regiment, the 134th, in WWII. It will come out next year, the 75th anniversary of the D-Day Invasion. The second new release will, set for spring 2019, will be a post-apocalyptic novel called Reaper Moon. The premise is that a virus has decimated the world’s population. Immunity to the virus is carried on the same gene that carries the sickle cell trait. As a result, the ethnic profile of the survivors in what is left of the US has been inverted. People of color are the majority and everything associated with health, wealth, and survival, is linked to blackness, while crime, the collapse of families, and violence are associated with whiteness. Many white survivors are fine with this, but those who are not are members of white supremacist groups, who declare war on people of color and their white allies. Reaper Moon plays forward many of the conflicts riling our country right now into a “what-if” scenario that serves as a stage to examine these divisions, their history, and the prejudice/irrationality that underlies them. It’s different with every book. With the Elk Riders series, it was finding the time, as when I was writing the story I was not yet a full time writer, I had a “day” job that was paying the bills. For Finding St. Lo, being a good steward of other people’s stories was a challenge, as was trying to balance the needs of surviving relatives and how disclosure of personal stories of their parents might affect them. For Reaper Moon, it has been the challenge of the material. Racism, violence, prejudice, are tough to write about day in and day out. I’ll be glad when it’s finished and I don’t have to step into that world any longer. Both. For Elk Riders there was early research and ongoing research on medieval living and settings, not to mention technical terms for equestrian equipment, swords, armor and shields. Finding St. Lo required deep research into original personnel lists, after action reports, and WWII era maps—many of which have been graciously maintained and made available on the web by families of men who served. Reaper Moon was the hardest book I’ve ever researched/written. After the first few drafts, I realized the antagonists—mainly white nationalists and supremacists—all were coming off as cartoon villains, caricatures. They weren’t real. These issues, this material, deserved a more nuanced depiction of the hate driving people. And the story needed—if not sympathetic villains—at least three-dimensional villains. So before I did a rewrite, I spent a month visiting really vile white supremacist, neo-nazi, and white nationalist websites and blogs. It was a bit like submerging my head in an unflushed toilet. But when I used those voices for the villains in the novel, it took on a new life and new depth. I write my best stuff in the early morning hours (sometimes the muse has showed up in the evening but most frequently we have breakfast dates not dinner). My desk is set in front of some floor to ceiling windows. I live in Seattle, so getting light is really important. That said, I often will have some candles burning nearby when I am writing new stuff. I also listen to music, soundtracks mainly, that match the tone/mood of the book I’m writing. I don’t write mystery, don’t know if I ever will (although I have some ideas), however, one of my favorite authors by far is James Lee Burke. I’ve read everything he’s ever written. Oh lordy, I’ve probably yammered on enough! Thanks for the opportunity to share.